I think the first point to be made is that this is Worshipping with Calvin. 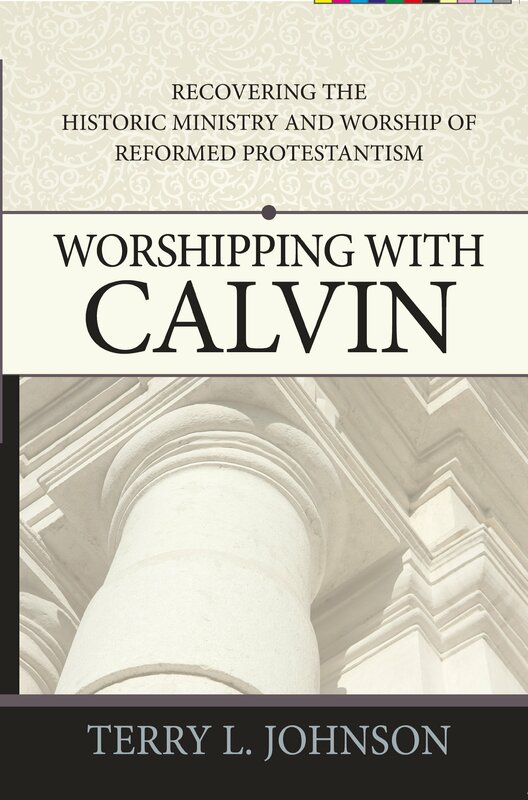 Not “Worshipping Calvin,” or even “Worshipping like Calvin.” Too often, Reformed Protestant folks are accused of trying to sidle up more with their favorite Reformer than paying attention to the Word. With that in mind, consider what Calvin and the other Reformers set out to do: recover Biblical practice in the Church at large. Most of them had shortcomings and blind spots in diverse areas, but they attempted to work through the implications of Biblical seriousness on all portions of life. This includes the “worship” aspects of the Church gathered in community. This is the concept of worship addressed in this book—while there is adequate acknowledgement that worship is in all of life, the focus here is on the Church gathered. Terry L. Johnson’s work here is clearly intended for extended thought and perusal. This is no summer beach read. If it’s not a summer beach read, then what it is? Worshipping with Calvin is a serious look at how Calvin structured and led churches in worship, and how those traditions morphed over time. Some attention is given to the rise of neo-Calvinism in Western Christianity, and this justifies the publication of the book. After all, if a church is embracing a Calvinist direction in its theology, as Capitol Hill Baptist in DC does, then a logical practical question is how that affects the worship gatherings of the church. The case is made here for a robust worship service based in Scripture. Scripture should drive the content of the songs, Scripture should be read, and Scripture should be preached. In the music, particularly, care is taken to highlight the value of varied types of music. Though many of the early Reformers had a preference for Psalm-singing only, Johnson advocates hymnody with a strong Biblical content as well. This is valuable. Overall, I can appreciate the effort here. I think that Johnson is answering problems that affect some churches, but not all, though they are potentially hazardous anywhere people are involved. I certainly must mention the largest drawback of this book: ENDNOTES. There are explanations and alternate points of view noted some hundred pages after the fact. It’s the publisher, but it’s still a drawback. Additionally, I would suggest that this is a text for a serious study of worship, and would be a valuable part of a leadership examination of a church’s worship practice. It’s not a Sunday School book, for certain, and probably not one that will hold the interest of those moving quickly through topics. I am not willing to say that Johnson has given us exactly how every church ought to worship, but he has given some excellent food for thought to the church. 432 pp, softcover, from EP Books. Also on Kindle. Book received in exchange for the review. Review initially appeared at Learning, Teaching, and Laughing, my personal blog.